If there’s one thing we know about our Mango users, it’s that they are globe-trotters. For both business and pleasure, you’re taking the world by storm, and you’re using Mango’s language and culture learning to support and fuel your adventures. Our business users face unique challenges (dare we say that word? Just this once.) while traveling internationally, and we’re excited to share our corporate-approved checklist of international business travel must-haves. Whether your trip is a short stint overseas or you’re preparing for long-term ex-pat status, these tips will ensure that your transition is smooth, simple, and a lot of fun. We know you swore off all varieties of homework the minute you graduated – we did too. But this is the fun kind: you’re in the driver’s seat, the rewards are measurable, and you can have a glass of wine while you work. Don’t believe us? Before you resort to your destination’s Wikipedia page, consider the benefits of immersing yourself in your new language and culture before arriving. Instead of depending on new acquaintances and co-workers to show you the ropes, you can wow them by immediately integrating with your seamless introductions, cultural know-how, and relevant conversation skills. So pour that glass of wine and dive into Mango’s fun and easy courses – mobile, desktop, Kindle, MP3; we’ll go wherever you go. 2. Start off on the right foot. Now that you’re well-equipped with language and cultural knowledge, it’s time to pack and prepare. Your smartphone is about to get even smarter by becoming your one-stop shop for directions, emergency numbers, translation aids (gasp! ), and of course Mango’s mobile learning app. Remember to check in with your supervisors and your cell phone provider about your phone’s coverage and data roaming fees (they can be staggering) and shop around for the most cost-efficient options. Many opt for keeping their smartphones for Wi-Fi purposes, but use a calling card or locally bought cell phone for phone calls. Whatever you do, have a technology-free back-up plan. We love our smartphones, but history shows that having a good old-fashioned map on hand is a best practice: just ask Magellan. Here's what you don’t want: you're stranded in a new country, with a dead cell phone, limited language skills, and vulnerability written all over your face. More likely than not, kind locals will help you out, but eager taxi drivers will see you coming from a mile away. We’ve learned our lesson the hard way a few too many times, so heed our advice and power up. Now we pack on-the-go power sources so that we can charge up no matter where we are. Helpful tip: pack the appropriate adapters for your new country and avoid a dead computer right before the big meeting. A second helpful tip: turn that "limited language skills" into "smart, useful problem-solving" by using Mango's courses, targeted for travelers and real-life conversations. We teach you how to ask for directions right off the bat. 4. Expect the best, pack for the worst. We're sure that your trip is going to be great. Whether you’re settling in to a new country long-term, or just for a few weeks, all good stories start with a hilarious anecdote – hilarious five to ten years from now, when the wounds have begun to heal. Let’s troubleshoot some rookie mistakes now by optimistically preparing for the worst (we do it all the time!). First off, just assume your airline will lose your luggage. Somebody has to draw the short stick, and for your own sanity, assume it will be you. The odds are forever in your favor, but you'll feel like the smartest traveler around when your carry-on is stocked with your essentials: a change of clothes (business appropriate! ), toiletries, medicine, and anything you'll absolutely need for work. Second: the jet-lag will catch up to you. Pack your own portable alarm clock to back up your phone’s alarms during those weeks of sleep-deprived adjustments. And on that note, pack your own umbrella, too. It will rain, maybe as soon as you step off of the plane, and it's easy to forget to pack that in your carry-on, stocked with essentials. Street vendors have a monopoly on the umbrella market, but do NOT pass go, do NOT collect $200 – more importantly, don’t spend it on an umbrella. Just bring you own. And an important safety note: keep a photocopy version of your passport on you at all times. The original is too precious to keep with you 24/7, but it’s crucial to have your papers handy at all times, along with a few emergency contacts and your embassy’s address and phone number. Leave the same important documents with a trusted family member or friend back home, so that if something happens, you're not stranded abroad (Unless you're in France, in which case that would be great). Do they give out awards for the most savvy traveler? If so, you’ll be on the short list. Your journey with Mango begins now. With your personal or corporate subscription (get your entire company on board! ), you’ll remedy those pesky little gaps in language and culture learning that have persisted for years. Many professionals find they're just steps away from conversational fluency in their target language. Mango is designed to close those learning gaps by providing business leaders with the skills necessary to turn proficiency into fluency. Practice makes perfect: all of our journeys rapidly build crucial skills, but Journey 4 is specifically designed for those quickly approaching ex-pat status. Based on the everyday scenarios of locals, you’ll learn to expertly navigate introductions, business social conversations, and important presentations. Sound like a dream come true? It gets better. We’re flight attendant approved. Your flight (and your layover) just got a lot more productive and fun: our mobile app doesn’t require Wi-Fi, so you won’t get kicked off the plane for using an app on your phone, Alec Baldwin style. When you do it our way, international business is a breeze. 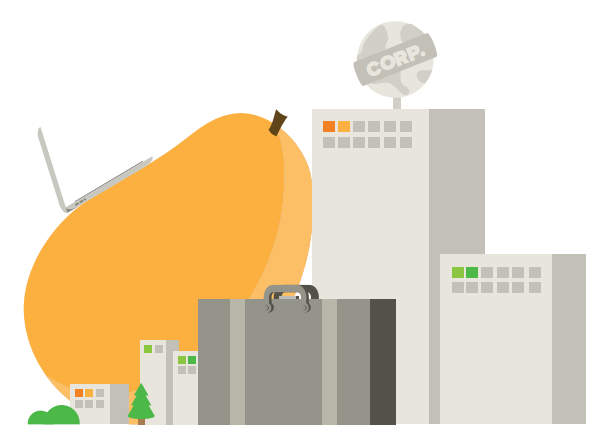 We can’t wait to see what Mango (corporate style!) can do for you, wherever your business may take you.